based in Switzerland playing for Neuchatel xamax FC. 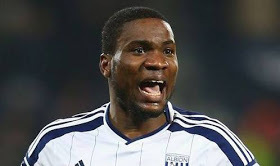 Brown ideye was alleged to have had a fling with Francisca Errol who is the mother of the child when she worked as a secretary with the football club. The son who is now six years old is still in the custody of Francisca Errol. for West Brom in the English Premier League but ignored the order and did not even appeal. xamax FC from 2007-2009, scoring 25 goals in 55 appearance. He currently plays for Tiajin Teda in the Chinese Premier League. But Francisca says she will make him obey the court.